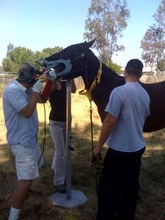 Equine dentist using speculum and power floater to care for horse's teeth. Over the last twenty years, interest in equine dentistry has grown, with the entire spectrum of the equestrian community from Olympic riders to backyard enthusiasts gaining an ever-increasing awareness of this important segment of horse health. As a result, the ranks of experienced dental practitioners have expanded, while technology has also evolved to meet the growing demand of these professionals to have the best possible tools of the trade. Depending on the need, most equine dentists use both power and traditional tools for maintaining a horse's teeth. Today, equine dental practitioners have much more equipment at their disposal than a basic stainless steel bucket and hand rasps. The advent of "power" tools (electrical or air-driven) have, in many ways, revolutionized the world of equine dentistry. However, some professionals choose to forego this popular technology in favor of "old-fashioned" hand tools, while online chat rooms are ablaze with discussion by horsemen who often vehemently prefer one method over another. As an owner, what do you need to know about manual and power dentistry tools in order to make the best decision for your horse's care? Specializing in equine dentistry since 2001, Dr. Tom Daugherty owns Advanced Equine Veterinary Practice in Stamping Ground, KY. In his work, Dr. Daugherty chooses to utilize both manual and power equipment. "I believe that each set of tools has its advantages," he explained. "In my opinion, a better overall job can be achieved with power equipment, but I still use manual tools in certain cases as well as for fine-tuning." Manual tools are the traditional route for equine dentistry practitioners, many of whom choose to "float" horses' teeth without speculums, tranquilizers, or additional restraint. Adjustments are made in a slow and steady fashion, which Dr. Daugherty believes is an advantage in some situations. "For young horses such as yearlings, dental enamel is much softer than in a mature horse, so in these cases, which just need minor adjustments, I often prefer to use hand tools," he noted. 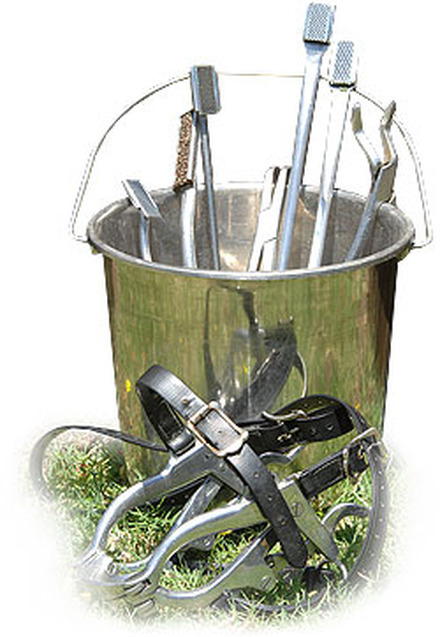 Additionally, manual tools are relatively inexpensive for practitioners to purchase, which generally translates into a lower bill for the horse owner. Quicker and less fatiguing, power tool floating can produce more accurate results with potentially less stress for the horse. The primary disadvantage of manual tools is, by definition, a lack of power. Use of these implements relies solely on the brute strength of the user, manually forcing the tool back and forth in the horse's mouth in an attempt to file down incredibly hard enamel. This can translate into a tiring and often lengthy job for both horse and practitioner, who is also often working blindly without a speculum or special lighting in the mouth cavity. Many professionals believe that for these reasons, hand instruments do not allow for a thorough examination and addressing of dental issues, which in the long run can be detrimental to a horse's health. A large number of dental professionals have embraced the advantages of modern power dentistry tools, which are credited with allowing for far more accurate procedures. "Power tools let a veterinarian do more precise work in much less time and with dramatically less physical effort," said Dr. Daugherty. "For instance, a horse with a major hook or step on its molars can have adjustments made in a shorter time frame, which results in less discomfort for all involved." Some equine dentists charge more for "power" versus "traditional" floating. The higher costs leads to resistance by many horse owners for selecting the power option. Because of the benefits resulting from the use of power floats, EquiMed hopes to see equine dentists eliminate tiered pricing for the use of power floats. Choosing power tools does necessitate that the horse be given a mild tranquilizer (which must be administered by a licensed veterinarian), and use of a speculum, lighting, and a stand to hold the head in a stable, neutral position. Although some owners may be opposed to the use of drugs or extra equipment, Dr. Daugherty sees these conditions as distinct advantages, allowing the practitioner to perform a thorough exam and procedure while the horse remains sedated and unafraid. With power tools, training of practitioners does take on an additional significance, as they must learn how to properly use the unlimited muscle now at their disposal. This increase in power does bring the risk of possible injury, such as thermal damage to the horse's teeth; however, studies have shown that correct use of equipment coupled with regular flushing of the horse's mouth with water can prevent any potential harm. Power implements also have safety features such as guards and power shut-offs which help thwart injury. "As with anything involving horses, there is always some degree of risk, which is why it's so important for an experienced practitioner to be conducting the procedure," noted Dr. Daugherty. "Horses are not statues, they do move, and accidents can happen with either power or manual tools. Regardless of the equipment used, the horse's mouth is very delicate, and one must be very careful and skilled." Individual preferences for the type of equipment used in equine dental care will persist. While more power may not always be the answer, the bottom line is that no one tool can address every equine dentistry issue. In addition, any instrument has the potential to cause harm if misused, making proper training and expertise of practitioners critical to your horse's care. As with any important equine health care decision, taking time to research and understand the issue is always the best decision. 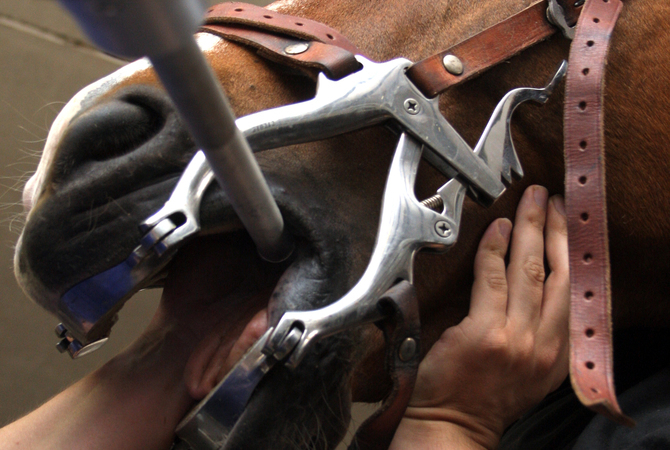 Learn more about equine dental care by visiting EquiMed's dental care health center.